Working with 2 carriages when both are selecting needles brings up some interesting issues. 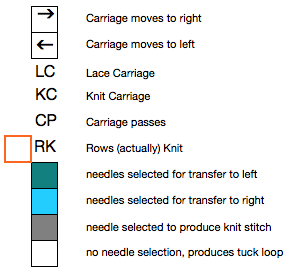 Studio machines are able in most instances to select and knit in the same row. Brother pre selects needles for the subsequent row, and on that row, while knitting the preselection, once again, selection is made for the next pattern row to be knit. 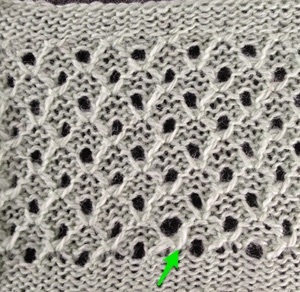 A couple of my earlier posts on topic knitting with 2 carriages and a lace round doily that combines lace with slip stitch selection to emulate holding for creating the needed spiral. When both carriages are in use for pattern selection, they will both engage the belt. While either carriage is in use, the alternate one needs to be off the needle bed, or the belt may actually break as one carriage holds it in fixed position, while the other tugs at it toward the fixed spot from the opposite side of the machine. Lace extension rails are used on both sides. There were variations over the years, including a pair to fit the bulky 260 KM. They are not always exchangeable between models, need to sit properly on the machine for carriages to be stable while stored to the side, and also for moving them off and onto the machine easily. 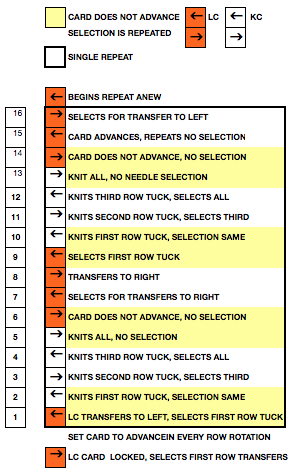 Pre punched standard Brother lace cards usually begin with the lace carriage selecting the first pattern row moving from the left side to the right. As with any lace or tuck fabric, knitting begins with waste yarn that is weighted evenly, and any edge treatment of choice. On the 910, because of the preselection factor, and to keep the pattern continuous in proper order, the knit carriage is removed from the right side of the machine, and the lace carriage does a preselection row from right to left. That will be its start and return position for the remainder of the fabric. The knit carriage is returned in turn to its home on the right end of the machine, on the extension rail. Two types of fabric are being created. 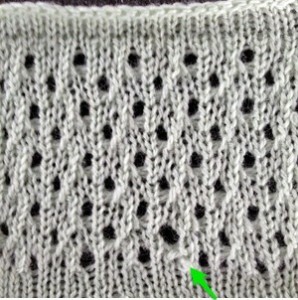 The goal is to have the edge stitches knitting throughout. 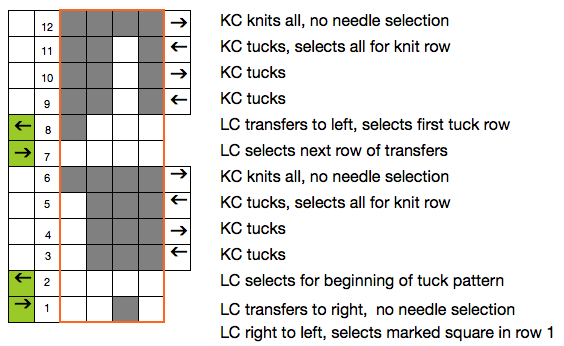 To accomplish this, if the LC is in use, eliminate any end needle selection by pushing needles back to B; when the KC is in use, if the end needle is not selected, to get it to knit, it needs to be pushed out to E. The pattern sequence is an easy one when up and running, with 2 passes of the LC, and 4 of the KC, as seen in the charts above. The question that follows is how to program the same design for use with a punchcard machine. Here things get a bit more confusing. The electronic machines advance the program or card a single row for each carriage pass, no matter their direction or sequence. 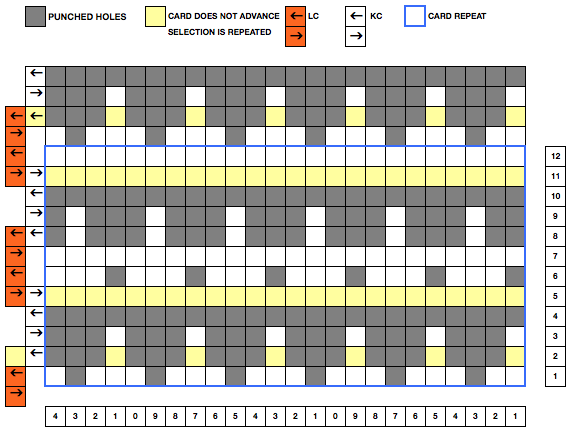 When the punchcard carriage is at rest on either side and the alternate carriage moves toward it, the card does not advance, so the needle selection stays the same, is repeated for a second time. A bit more planning is required and the repeat needs to be shortened to accommodate for this fact. 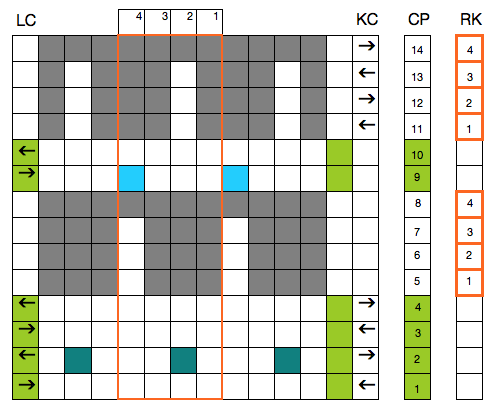 Fabrics with color changes every 2 rows such as mazes and mosaics are easily knit on the electronic with 2 carriages. 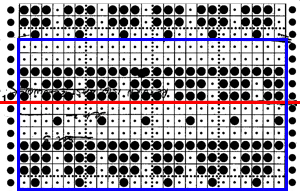 If worked on a punchcard machine, they would have to be executed using a yarn changer and only the knit carriage, unless the design motif is redrawn to factor in the issue discussed above. 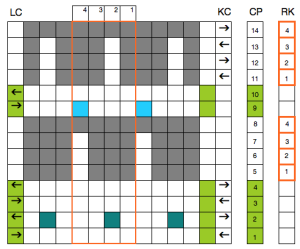 A previous post, part of a thread on mazes and mosaics, with a punchcard swatch photo. The first preselection row in any patterning that involves color or carriage changes every 2 rows, is usually done toward the side of the machine that holds either the color changer, or the carriage next in use. As seen above, there are exceptions to that “rule” as well.